Moist, tender and flavorful chicken is the key allure of beer can chicken. The classic cooking technique has been a favorite of backyard grillers for quite some time. While I have a hard time believing that the concept is anything new, I’m pretty sure the trend of kitchen gear emulating the process is a relatively recent phenomenon. Be that as it may be, what is important is that with this high-quality pan, beer can chicken has officially moved from the backyard to the kitchen stove. 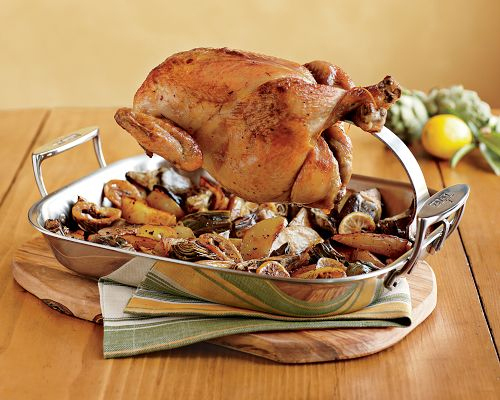 The All-Clad Ultimate Chicken Roaster features a removable arm for suspending the bird over the pan. At the end of the arm is a reservoir that can be filled with not only beer, but any liquid you choose. This has a dual benefit as the elevated chicken is basted from the inside, while flavorful drippings season any vegetables included below. Try lining the bottom of the pan with potatoes for an easy to make full-flavored meal; the potatoes capture all the drippings while the chicken browns evenly on all sides. The triple-ply bonded metal construction features an aluminum core sandwiched between two layers of stainless steel. The quality craftsmanship and removable suspension arm make this beer can chicken-inspired device perfect for everyday cooking. However, with such a convenient design, chances are you are going to be using this roasting pan to cook a lot more chicken—and open a few extra beers.